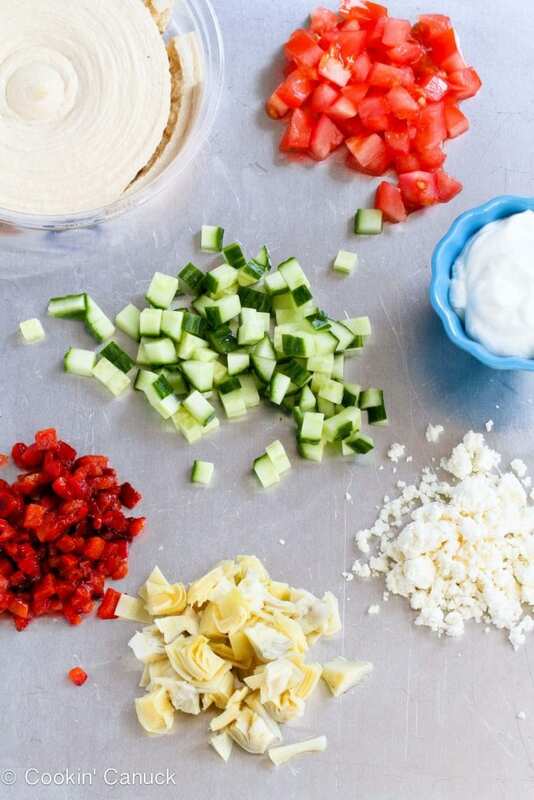 This Mediterranean 7-Layer Dip recipe rights a wrong for me. I’ll admit it. It wasn’t love at first bite when I first dipped into the traditional southwestern 7-layer dip. The culprit was the refried beans. It probably didn’t help that my initiation into the world of refried beans was during my first (and ONLY!) late-night/beer-soaked trip to Taco Bell in college. I was lured in by the dulcet tones of that darn talking Chihuahua. With Super Bowl Sunday coming up (and the need for healthy game day recipes), I wanted a dip that I could throw together in 15 minutes or less, and that would make me forget that ill-advised drive-thru adventure. So, why not replace the refried beans with hummus, the sour cream with nonfat Greek yogurt and make a shift to Mediterranean flavors? Take out the guacamole, salsa and Monterey jack, and layer in artichokes, roasted peppers (see How to Roast a Bell Pepper) and feta cheese in their place. Of course, you can layer the ingredients any which way you please, or substitute in other ingredients, such as kalamata olives or sundried tomatoes. 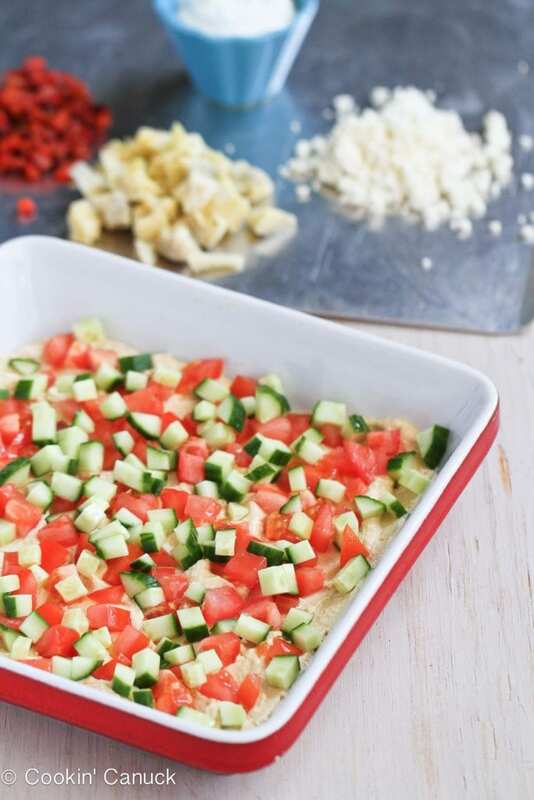 Serve the Mediterranean 7-Layer Dip recipe with raw vegetables, pita chips or lentil chips. 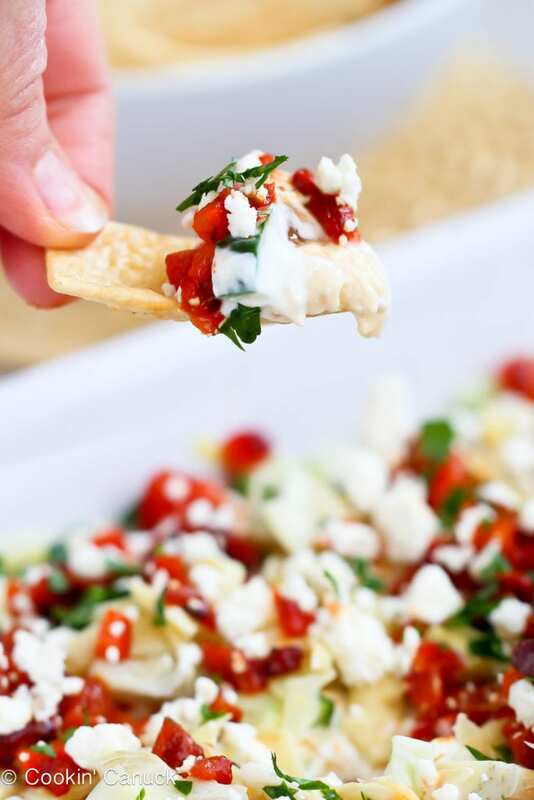 Don’t you dare tell your beer-swilling Super Bowl guests that this dip is healthy. They’ll never know the difference! In an 8- by 8- square serving dish, spread the hummus evenly on the bottom. Layer the tomatoes and cucumber over top. Dollop the yogurt over the vegetables, then gently spread with a rubber spatula. Sprinkle the yogurt with salt and paprika. 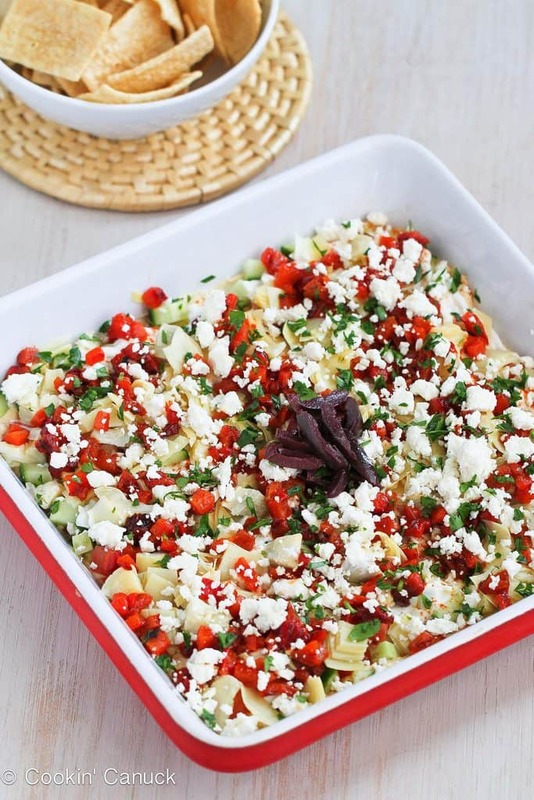 On top of the yogurt, layer the artichoke heart, roasted red peppers and feta cheese. Sprinkle the parsley over top and garnish with olives. Serve with fresh vegetables, pita chips or crackers. I freaking love dips like this and always gravitate towards them at parties. So nice! I’m the same way, Katrina! Stand me beside the dip and I’m a happy camper. This sounds like a good alternative to the Mexican version which I do like. I didn’t notice any guys commenting how they liked this. Any updates on how they reviewed it? 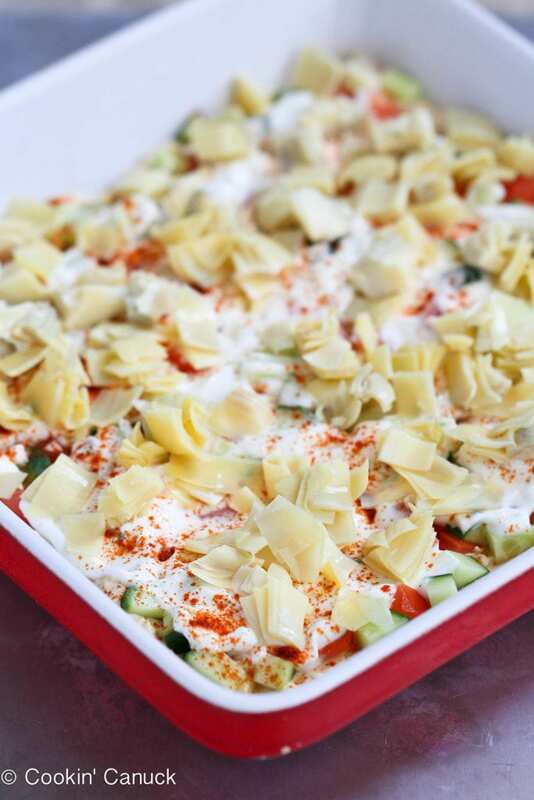 I love this Mediterranean layered dip Dara – right up my alley! Thanks, Jeanette! There’s nothing better than an appetizer that tastes great AND is healthy. I am obsessed with this dip. I am staring at those pictures, imagine hopping right into the middle of those 7 layers of creamy (healthy!) deliciousness! I am not a fan of the traditional Mexican version either, but these mediterranean flavours are SO up my ally! Pinned! Thanks so much, Taylor! Yeah, the Mexican version just doesn’t do it for me. But I could snack on this one all day, every day. Wow! That couldnt look much better! This would be the perfect dip, and so many healthy ingredients! I cant wait to give it a try! Yum! Perfect for superbowl sunday! Thanks, Tina! I hope you have a chance to give it a try. Thanks, Ali. And even better…it takes only 15 minutes to pull together. Dara!!! This could not look more delicious! Definitely adding it to my Superbowl Menu!! Thank you, Jenny! We’ll be making another batch for Super Bowl Sunday, for certain. Thanks, Bridget! I wish we could enjoy it together. It would definitely be a big hit at any party Dara. When do we not want to have something that is both good for us and delicious. I agree completely! And I always go overboard when there’s appetizers involved…I need the healthy stuff. You got it exactly right– it’s the refried beans that keep me away from those 7 layer dips too. I think your updated version is a great idea! I hear you…those refried beans turn me off every time. I hope you have a chance to try this version! Thanks Dara for the nice recipe. Have a Happy Wednesday. This is such a great way to spice up a jar of hummus, love the Mediterranean flavors! Thanks, Laura. The flavors kept me snacking on this all day long. There’s something about roasted peppers, artichokes, etc. that I just can’t resist. Yummo! Not only does this look beyond delicious, but it’s so pretty too. Perfect for a get together! Thanks, Kim! Colorful food always makes me want to dive right in. So pretty and I love the flavors! Thanks, Tieghan. I had a lot of fun layering all of these flavors together…and then eating it. Aren’t those flavors amazing? I love making a layered dip with hummus on the bottom. And to take the Avocado Feta dip from Two Peas and Their Pod? An even more amazing base! Your photos are lovely and this looks so fresh–thanks! That’s a great idea to use Maria’s dip as a base. I’ll have to try that. And thanks for your sweet comments, Kirsten. This sounds amazing! Love the Mediterranean flavors! Thank you, Jessica. Mediterranean flavors always draw me in. I’m thinking of putting some of this dip on a wrap sandwich today. SUPER BOWL!! Absolutely. You’ve already made me a cavern of hunger once this week – okay, twice – and here we are again. You should seriously consider a box in your sidebar, warning people to eat before they come here, like how you’re not supposed to visit the grocery when hungry. Can’t wait to make this for the big game! You are too funny! Thank you, Cindy. Now, if only we could watch the big game together and share a Super Bowl feast. This is so fantastic!! I love the OG 7 layer dip too, but having a guilt-less one is even better! Thanks for sharing Dara! Thanks, Natalie! 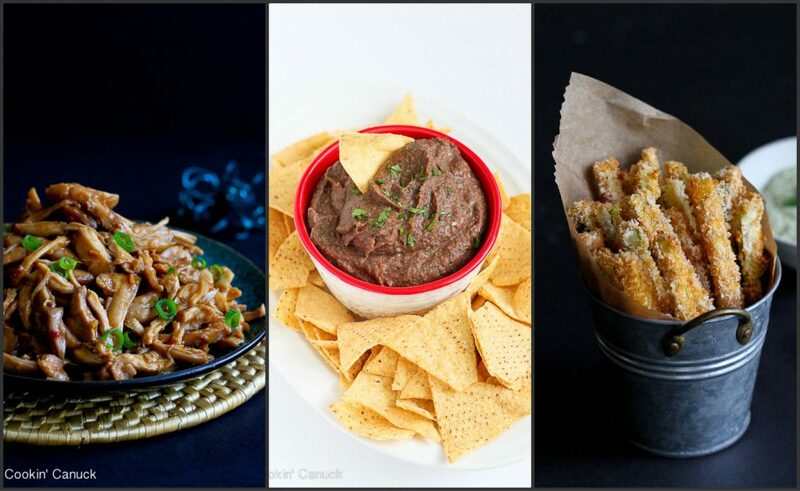 There is definitely something to be said for guilt-free dips on Super Bowl Sunday (or anytime). 1st time visitor and novice in the kitchen…hope you don’t mind what is likely a silly question. How do I roast red peppers? We used to have a steamer thing and would put them in there, but it was one more kitchen contraption that we rarely used so we got rid of it. Haven’t had red peppers any way besides sauteed in a pan since. Alternatively, you can buy jarred roasted red peppers (packed in oil) at most supermarkets. You can usually find them alongside jarred artichokes or olives. I’m so glad you stopped by and hope you do again! Thank you, Averie. Artichokes are a favorite of mine, too. One of my favorite dips is a simple artichoke pesto…it’s hard to stop eating it. Looks so fresh, Dara! We just returned from visiting family in Canada and I got to be reminded how much I love 7-layer dip. Such a guilty pleasure!! 🙂 Thank you for sharing this healthier recipe! Delicious, Dara! This is one of my favorite apps to take to gatherings. I just love the flavors and colors! This dip looks addicting 🙂 yum!! Looking forward to making and serving it this evening at a get together 🙂 🙂 It looks so good!!! You are a genius! Thanks for sharing…I can’t wait to try this!!! Looks amazing. Can’t wait to try it. But will substitute the Greek Yogurt with tzatziki which I just learned to make. I’m drooling just thinking about the flavor mix. This looks amazing and is right up my alley when it comes to healthy dips, I’m going to make it for a pool party I’m going to next weekend! What a data of un-ambiguity and preserveness of precious experience regarding unpredicted emotions. it helped me outt a lot. I hope to give something back and aidd others like you aided me. Dara, how much in advance do you think this could be made without sacrificing any of the quality? It looks so good! Jane, we snacked on this for a full 24 hours. But, to be safe, I would make it no more than 4 hours in advance to make sure it looks fresh and pretty. I hope you enjoy it! How big a can of artichoke hearts did you use? I’m making this for Super Bowl and can’t wait to try it. Hi there, Natalie. The recipe actually just calls for 2 artichoke hearts from a can. I typically by a 14 oz. can and pluck two of the hearts out of there, reserving the rest for another use. I hope you enjoy the dip! Dara, thanks for clarication on artichoke hearts. Perhsps if you reworded to something like “2 atichokes from canned …” it would add clarity. Thanks. Can’t wait to make this party this weekend. Thanks so much for letting me know, Brie! I regularly make this for get-togethers and it always seems to be a hit. So far 5 friends have asked me for the recipe. The flavors in this are so good and I love the addition of artichoke hearts! I made this yesterday for the Super Bowl, and it was a HUGE success! Thank you very much for this recipe. This caught my eye on Pinterest. The red & green would make it a lovely Christmas appetizer. I’ve been trying to figure out what else to serve with the lasagne. My thoughts on the ingredients: With the cucumber and yogurt, you’re half way to Tzatziki. I’m taking it the rest of the way & maybe add zucchini. theWanderLustKitchen has a great recipe for Authentic Greek Tzatziki. I think I will replace the yogurt layer with that. Time to go shopping..